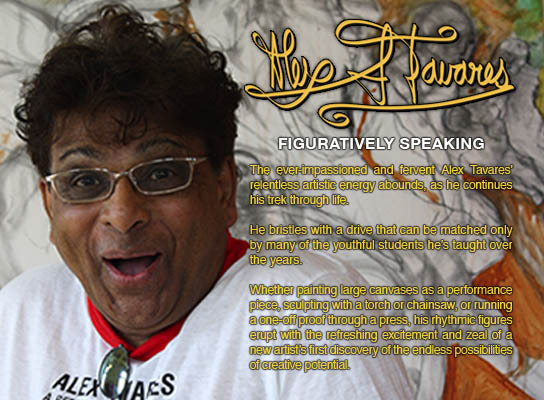 The ever-impassioned and fervent Alex Tavares’ relentless artistic energy abounds, as he continues his trek through life. He bristles with a drive that can be matched only by many of the youthful students he has taught over the years. Whether painting large canvases as a performance piece, sculpting with a torch or chainsaw, or running a one-off proof through a press, his rhythmic figures erupt with the refreshing excitement and zeal of a new artist’s first discovery of the endless possibilities of creative potential.